I am lucky enough to live in one of the most innovative and interesting parts of London, food-wide (and otherwise!). It seems every week there’s a new pop-up, food stall or story that emerges about some young startup doing exciting things with food, and today was no exception. Tonight was the inaugural night of Street Feast London – the Dalston chapter. I’d never made it to its Brick Lane or Camden counterparts, but luckily for me, they’ve just moved to a new site just opposite Dalston Junction station. Since it was such a nice evening, I decided to stroll down and check it out. Whether it was the fact that Murray had secured his place in the Wimbledon finals but an hour before, or that it was one of the nicest evenings we’ve had all “summer”, there was no denying there was a sense of laid-back (natch) jubilation in the air. Housed in a long-disused outdoor car park/warehouse space round the back of Eastern Curve garden, the stall holders were gathered around, with one long table running down the middle. There were about 16 stalls in attendance, from stalwarts such as Homeslice, Yum Bun and Anna Mae’s to relative newcomers such as Roost, Pop Up Barbados and Bare Grillz. Around the corner, street artists created wall-art alongside guests making good use of the ping pong table. With such a range of cuisines and dishes, it was difficult to decide what to go for. A goat curry from Vinn Goute? Some deep-fried buttermilk chicken from Roost? A cupcake from Molly Bakes? Or perhaps a cone of spicy Jahl Muri from The Everybody Love Love Jahl Muri Express? In the end, I opted for a jerk chicken wrap from Mama’s Jerk Station. With this many amazing stalls to choose from, I can see this becoming a Friday-night ritual. 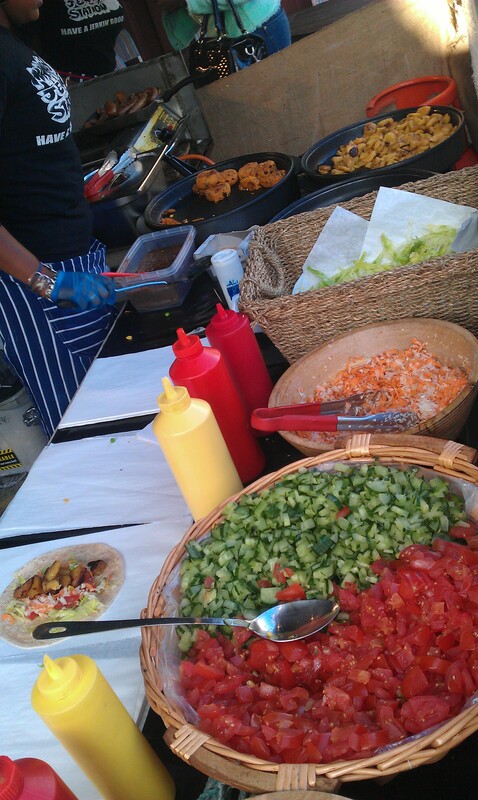 Street Feast London is on every Friday until the end of August, 5pm-midnight at Thames House, Hartwell Street, E8 3DU. Two of my favourite places in the neighbourhood – E5 Bakehouse and Dalston Eastern Curve Garden – joined forces today to host a free pizza workshop. E5 Bakehouse was set up a couple of years ago by Ben Mackinnon to revive the lost art of artisan breadmaking. Their chewy, slowly-fermented sourdough loaves are rapidly gaining a cult following in Hackney and recognition across London. Dalston Eastern Curve Garden is an incredible community garden, a stone’s throw from Dalston Junction, that’s so peaceful that as you walk around the raised vegetable and herb beds, the only way you’d realise you were in East London is seeing the street art on the wall. The class was part of Adult Learner’s Week, which has been going on all over the country this last week, offering free taster sessions in everything from Zumba to cross-stitch. But today 20 of us were learning how to make authentic wood-fired oven pizza. Of course, part of the joy was in baking and cooking outdoors (despite the chill in the air), but if you get your oven hot enough and use a pizza stone/granite slab, I’m sure you could recreate it at home. 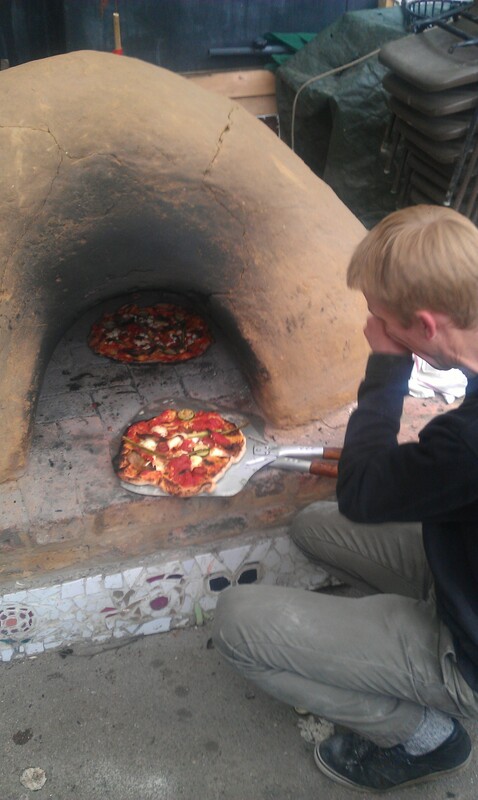 We cooked the pizzas in a clay oven, built by the community last summer. By throwing in a few logs, the oven was soon up to 515C – so just slightly hotter than your regular oven… It really does make a huge difference though: simply chuck your pizza on the peel, shimmy it onto the base of the oven and two or three minutes later, your base is risen and crispy, your toppings perfectly cooked. Jamie Oliver does a range of wood fired ovens (is there anything he hasn’t stuck his name on?) but they retail at about £1000. Quite an investment for the occasional pizza in the garden. You can, however, build a clay oven for about a tenth of the price – a project for a long weekend perhaps! Whisk together the fresh yeast, water and olive oil, then pour into the flour and mix until it comes together in a sticky dough. Leave the dough in a warm place to rest for 10 minutes or so, then knead in the salt. Leave the dough to rest for another 10 minutes. Turn the dough out onto a lightly-floured surface and stretch and knead the dough for 5 minutes. Place the kneaded dough in a lightly-oiled bowl, cover with a tea towel and leave in a warm place for another 45 minutes. Meanwhile, fry the olive oil and red onion in a large glug of olive oil. Once softened, add the chopped tomatoes and crushed peppercorns, then simmer for 10 minutes or so until slightly reduced. Tip out the dough and stretch it out into a circle as thin as possible – try spinning it if you’re feeling brave! Next spread the tomato sauce thinly over the top and add whatever toppings you fancy. We had chorizo and salami, goat’s cheese, sundried tomatoes, freshly-roasted asparagus and courgette… And freshly-picked thyme, oregano and basil from the garden, of course. Three minutes later, perfect pizza. All in all it was a brilliant afternoon – meeting some other locals, gleaning some knowledge from Ben and pizza-pro Dan, and spending the afternoon cooking outdoors in the beautiful garden. Thank you to all involved! You can find E5 Bakehouse in Arch 395, Mentmore Terrace, just by London Fields station. They’re open 7am-7pm, 7 days a week and as well as selling their excellent bread, also serve breakfasts, lunch and, on Sundays, pizza. Dalston Eastern Curve Garden is opposite Dalston Junction Station and is currently open every day from 11am-6pm. They are launching the first ever Dalston Flower Show tomorrow, which runs for 3 weeks. Let me ask you a question: When was the last time you sat in a coffee shop, sipping a steaming latte/flat white/americano? If our coffee-fuelled society is anything to go by, chances are it won’t have been that long. Have you ever wondered how this magical black elixir came to be such a vital part of our culture today? Or to put it another way, have you any idea how many aspects of society have been influenced by coffee over the years? Unreal City Audio have just launched a Coffeehouse Tour, traversing the streets of The City exploring the rich history of London’s coffeehouses over the last 350 years. For those of you who read my previous post, Coffee Culture, and are noting some similarities, you’d be quite right. The tour was led by Dr Matthew Green, who gave the excellent lecture at Selfridges a few weeks back. However this time, we were standing on the actual sites of the coffeehouses, rather than looking at drawings and paintings, and we were joined by actors and musicians, who brought the historical documents to life. I won’t rehash all of the history from the previous post, nor do I wish to spoil the tour for any future participants, but I hope to capture some of its essence and persuade you to book in for the next date – I’d wholeheartedly recommend it. Enough of the preamble: to the tour. We meet in front of St Michael’s church, an unassuming building on Cornhill, now hidden amongst the surrounding office and tower blocks. Fittingly enough, we’re opposite a Starbucks, and several of the tour members are clutching a coffee in a desperate attempt to stave off the -1°C chill. Matthew greets us and we start to retrace the steps of our coffee-drinking ancestors. The first stop is the The Jamaica Wine House, which stands on the site of London’s first ever coffeehouse, set up by Pasqua Rosee. Three hundred and fifty years ago, we would have been standing at the residential core of London. As vivid and evocative as Matthew’s descriptions are, it’s difficult to imagine that this peaceful courtyard would have been a bustling metropolis and Pasqua Rosee seems like a fictional character long since forgotten. That is, of course, until a triangle is dinged and we are transported back in time… The soulful notes of a violin come drifting around the corner, and then Pasqua Rosee himself comes leaping out from an alleyway, hawking his coffee, exuberantly expressing the ‘vertue of the coffee drink’ in his thick Greek/Turkish accent. It is excellent to prevent and cure the Dropsy, Gout and Scurvy. It is known by experience to be better than any other Drying Drink for People in years, or Children that have any running humors up on them, as the Kings Evil. It is very good to prevent Mis-carryings in Child-bearing Women. It is a most excellent Remedy against the Spleen, Hypocondriack Winds, or the like. Extract from The vertue of the coffee drink, a bill published by Pasqua Rosee, c.1652. In the quiet of The City on a Saturday, Pasqua Rosee’s flamboyance (played by Jonathan Hansler) echoes around the courtyards, attracting a few inquisitive stares from passersby. And so the tour continues, with in-depth historical information and anecdotes interspersed with captivating performances – the ghosts of 17th century London brought alive by a simple Pavlovian ding of the triangle. Matthew acted as our guide not just to the streets and alleyways of the city, but to the characters who walked those streets and whose lives were shaped (and in some cases, destroyed) by coffee over three centuries ago. We continue down Lombard Street, and arrive at what was once Lloyds’ Coffeehouse– the first port of call for weary men coming off the ships, bringing news of the colonies. It soon evolved into London’s first insurance broker. Time moves on relentlessly and the site is now a Sainsbury’s, the counter that once housed underwriters and financial backers now home to ‘Meat & Fish’. It’s this juxtaposition that makes you realise how easy it is to miss the underlying history of this ever-changing city. We stop briefly at Garraway’s and Jonathon’s coffeehouses (birthplaces of the auction house and stock market respectively). Passing our sixth Starbucks of the tour, we at last hear of the global brand that – love it or hate it – has taken over our high streets. A short polemic on the prolific chain follows from both Matt and Pasqua Rosee, who has been catapulted into the present day only to discover that someone else realised his dream of creating multiple coffee shops across the city and that to his horror, it is not a Turk’s but a mermaid’s head that hangs above the door. The tour ends at Ye Olde Cheshire Cheese pub, which was quite a revelation. Whilst it has always been a pub, not a coffeehouse, it does date back to the 16th century, so its decor is similar to that which you would have found in many a coffee shop of 1667 (following the Great Fire). Low ceilings, big oak beams, dark wooden panelling and exposed brick in the cellars… It’s the perfect place to end a fascinating and captivating tour. Unreal City Audio are running the Coffeehouse tour (£12) on 24th March (11:30am and 3pm), and a special Chocolate Tour (£15) on 7th April at 3pm. I’ve just returned from a lecture – at Selfridges of all places – titled Coffee Culture. Rather than discussing the ubiquitous sub-culture of addiction to caffeine and milk that is plaguing our cities worldwide, it instead looked at the fascinating history of London’s coffee houses, as they were once known, from their creation in the mid-seventeenth century to their demise in the late nineteenth. For just over a month (until 1 March), Selfridges’ Ultra Lounge has been transformed into a library of floor-to-ceiling books. Inventive displays fill the walls. Seemingly ancient typewriters are up and running, offering an inescapable draw for anyone old enough to remember how to use a typewriter to leave a note to the next visitor on the blank white page. There’s an eclectic selection of books, all available for you to browse or even sit down and read on one of the supremely comfortable sofas. For free. There’s also a series of events and lectures. Tonight’s lecture was given by Dr Matthew Green, with additional moments of brilliance from Somerled Mackay, who brought all of the historical quotes to life. 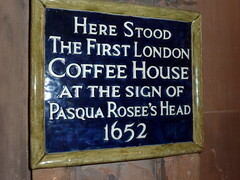 It was Pasqua Rosée, a Greek man who had spent much of his life in Turkey and on the Dalmation coast, who set up London’s first coffee house in 1652. His shack was positioned in St Michael’s Alley, Cornhill and before long, queues were stretching down the alleyway, filled with weary Londoners desperately in need of a shot of the dark stuff to wake them up. Not all that different from today, you might think. However, the very essence of the coffee shop was entirely different. Today you enter a Starbucks and find most people on their laptops, mobiles or at the very least huddled in twos and threes. Back in the 17th and 18th centuries, coffee houses were where one went to discuss current affairs, politics and all important matters. In fact, certain coffee shops were known for their particular specialty – St James Square for media, Westminister for politics, The City and East London for news from the colonies. And they were a much more communal affair. Long tables dominated the upper rooms (for they were rarely found on the ground floor). Once you paid your penny entrance fee, you’d be accosted with a ‘What news?’. Offer up a snippet of new news, gossip or information and your fellow coffee-drinkers would surreptitiously shuffle around the table to create a space. Several of the hundreds of daily and weekly newspapers (after the stringent laws on licensing were lifted in 1694) would be scattered across the table. The coffee houses were dominated by men. Other than those on the extreme ends of the social scale – duchesses attending an astronomy lecture and whores looking to pick up business – women did not enter coffee houses, for risk of tarring their reputation. Coffee shops grew more and more popular as the British empire, and in turn, the middling classes, prospered. However, they ultimately fell out of favour as technology and methods of communicating news developed. The final traditional coffee house closed but two months after the Transatlantic telegraph cable was laid in the 1860s. Coffee houses, as a source of news, had been replaced by much faster and more accurate methods. And of course, the arrival of tea at the end of the 19th century didn’t help matters either. Apart from a short Victorian misguided revival (in an attempt to get those darstadly scoundrels out of the alehouses), the coffee house more or less disappeared until the 1950s. At first, they sprang up in Soho, at a time when teenage culture was developing and the new generation were wanting to revel in their post-war freedom. They remained fairly low-key and independent until the 1990s. 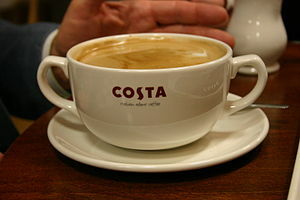 Costa Coffee, first opened in 1978, was bought out by Whitbread in 1995. Pret a Manger was founded in 1986, Caffe Nero in 1997 and the first UK Starbucks opened in 1998. We’re now experiencing an ever-growing selection of ‘Third Wave’ coffee shops, set up often by Antipodeans as a backlash against the watery substances chains are pumping out. Small independents that painstakingly do everything thing they can to create The Best Cup of Coffee. It’s become a bit of a Holy Grail for many, myself included. Matthew took an interesting viewpoint though – he said he’d be quite happy to drink instant (involuntary gasp) if there was an interesting person to sit next to and strike up conversation with. Now there’s a refreshing thought. What if coffee shops did become more like those in the days of lore, where people sat round and discussed current affairs, or interesting people they’d met, or even gave a snippet of their life story? One thing I’ve found from my travels is that every single person has a story to tell. It’s a sobering thought to think that there are 7.5 million stories wandering around London, brushing past each other on daily basis, waiting to be uncovered… if we just had the courage to strike up conversation. Coffee Culture was held as part of Selfridges’ Words Words Words festival, in conjunction with The Idler Academy, a bookshop (that serves coffee), has one large table and encourages discussion. They also hold a series of lectures, workshops and courses on everything from Latin to Ukuleles. If you’d like to hear the Coffee Culture talk in person, it’s on again on 29 February at The Idler Academy, 81 Westbourne Park Rd, W2 5QH. We were ushered into a dark, smoky room that housed a giant tree in the centre. It had what looked like conkers hanging down from the branches. On closer inspection, they looked remarkably like profiteroles. Well it wasn’t long until someone’s curiousity got the better of them. With a mischevous glint in their eyes, they plucked a profiterole off the tree and bit in. Goat’s cheese and beetroot. Other canapés included spherical balls of olive-flavoured liquid (masquerading as an olive) and impossibly-thin sugar discs sandwiched around a smidgin of goat’s cheese and beetroot purée (again). The starter continued the Harry Potter theme with witches-hat style domes covering out plates. They were, in fact, trapping smoke. Upon lifting the glass domes, smoke tumbled out to reveal a smoked risotto mousse. Unfortunately risotto is one of those things whose brilliance is in its texture, so digging into a rice-flavoured, smokey mousse when you’re expecting a creamy, rich risotto with a bit of bite is somewhat of a disappointment. 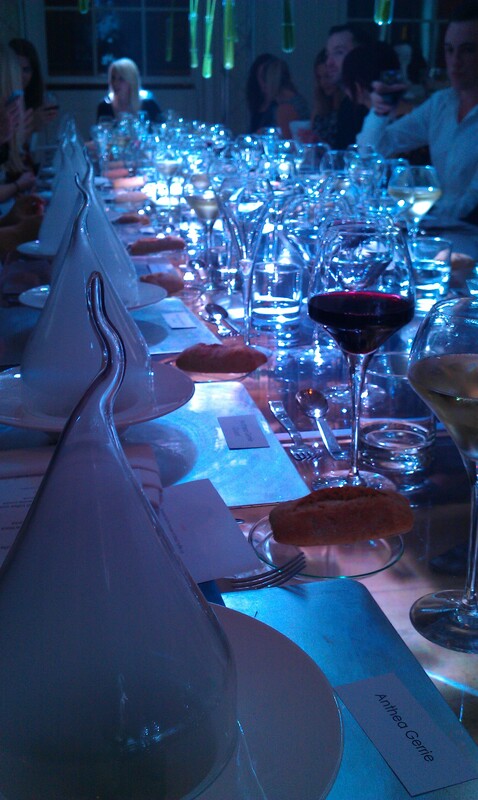 The next course, while visually stunning, also just fell a bit short of the mark. Monkfish dumplings with chorizo caviar, crispy fennel spikes and jasmine black quinoa sounds incredible but the monkfish was just a little too chewy and overdone, and the amount of dumpling overpowered any flavour that had survived. That said, the chorizo caviar was fun – little spherical balls of pomegranate liquid that popped in your mouth. Much preferable (in my mind) to actual caviar. The quinoa had a lovely deep flavour too and smooth texture – very different from the quinoa you traditionally associate with healthy salads! Dessert, while rich, was almost enough to redeem the entire meal. 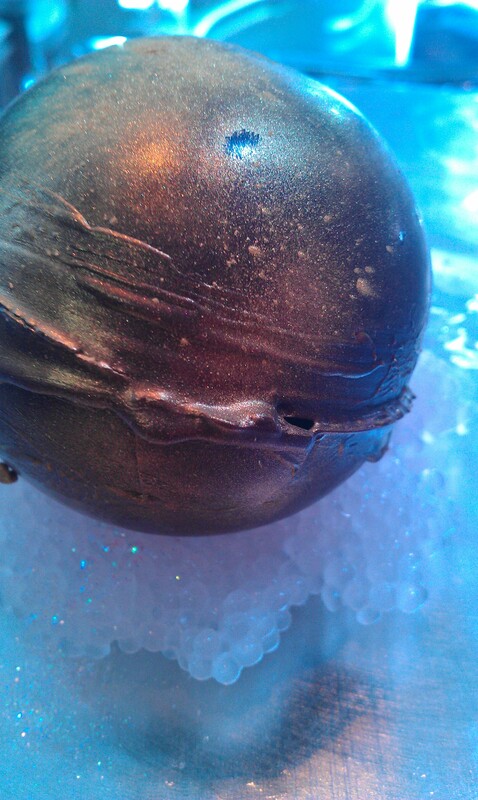 We were each presented with a perfect chocolate ball, shimmering like a celestial planet that had fallen out of orbit. When everyone was ready, the waiters came and poured a hot yogurt sauce over the top, resulting in the most beautiful and unique shapes as the chocolate ball melted in different places. As holes and caverns opened up, a dried fruit medley tumbled out, which was paired with a white chocolate ganache. All in all, very rich, but very delicious. It was a spectacular evening, no doubt. Not all the food tasted as good as it looked, but the canapés in particular were fantastic, and it’s certainly not the kind of thing you could do yourself at home. 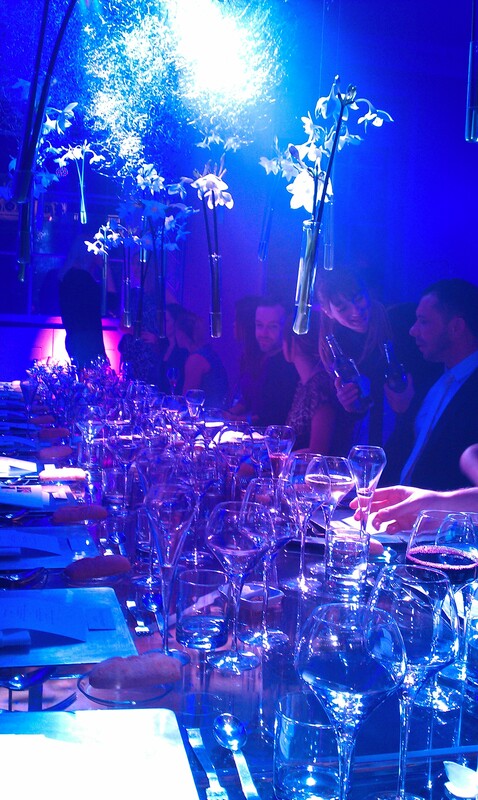 If you’d like to book Bubble Food for a show-stopping party (with lots of ‘ooh’s and ‘ah’s), or want to find out more information, visit Bubble Food.